That is a great picture. Merry Christmas to ya! Bethany, what a gorgeous Christmas card! They all look so lovely! 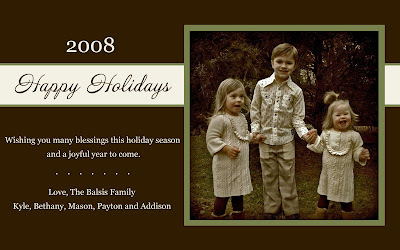 We hope you had a blessed Christmas and wish you all the best for 2009! What a beautiful Christmas picture of 3 beautiful kids! You have such a beautiful family- love the card! Great card Bethy! Absolutely beautiful! Your kids are so, so adorable.